Keeps your CatGenie 120 running properly by cleaning and sterilizing. Same ingredients used by veterinarians to sterilize their exam rooms. Lasts for up to 240 washings depending on number of cats in your household and the number of cleanings per day. Alerts you when SaniSolution is low so you'll be able to make sure the unit runs properly. Safe, Biodegradable and recyclable cartridge. The 120 Cartridge is designed for the CatGenie 120 Model. It's like a perfume for your cats, and your washroom (or basement, or wherever you put your Genie). Instead of smelling like what they just pooped out, my cats smell like they actually care what other people think of them. Thanks, CatGenie! 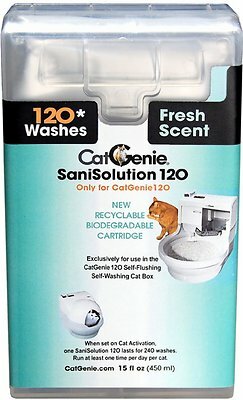 We love our Catgenie 120, and the unscented/"scent-free" sanisolution is the *best*! Hygienic, but no problem for our asthma and allergies. I love the sani solution. I hope the cartridges last a long time I am looking forward to my Catgenie being around for awhile. The fresh scent doesn’t hardly have any scent like they use to and some times none. Love that chewy carries these so we can get them quickly when we run out and forget to order more in time. Love the cat genie! In my opinion the greatest invention of all times! I’ve had mine set up for over 10 months and I’ve had to do absolutely nothing except replace a cartridge. I read reviews that gave it a poor rating but after owning mine I think perhaps they failed to set it up properly. There’s a small ball that actually looks like a cat toy and if you don’t put that in the hopper the machine will not work properly. I almost left this out until I completely read the instructions. I have two and I’ve never had a moments trouble with either(one of which I bought used at an animal rescue thrift store so it had a previous life and is still going). Litter box is always clean and no odors!!!! Bad quality control. I have received 7 defective cartridges now. They will not work. Duds. The CatGenie sensor does not recognize the cartridge. It is a problem with their label being applied wrong. But removing the label still doesn’t fix it. We had this mostly with the scent free cartridges. For whatever reason, we have had better luck with the fresh scent cartridges. The only good news is that Chewy customer service has been great about giving me refunds and replacements over the phone, without having to return the bad cartridges. Fast shipping and ig you dont have a cat genie do research on one you will live it too!